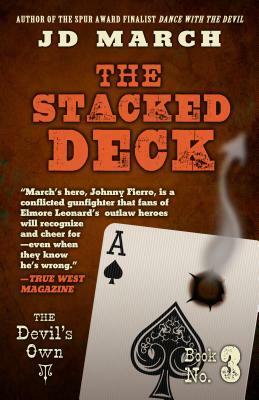 THE STACKED DECKBy J.D. MarchPublished by GALE/CENGAGE LEARNING322 PagesBook No. 3 in the “The Devil’s Own” series.Johnny Fierro, gun fighter turned rancher, finds himself deep in the legal system of Utah as he faces charges of a crime he didn’t commit. Or did he?A prologue hints at the crime. Johnny’s father (Guthrie Sinclair) welcomes an old friend, (Burnett) to the Sinclair ranch. Johnny finds himself suspicious of Burnett as time passes, and we come to find out what kind of man Burnett truly is. An occasion arises that requires Burnett and Guthrie to leave the ranch, leaving Johnny and his brother Guy in charge – and just in time for a pair of legal types to arrive at the ranch, arresting Johnny on suspicion of that previously mentioned crime in Utah. Guy insists on going along on what would be an adventurous stage coach ride, as does the local sheriff (Stoney). Once in Utah, a trial takes place after some finagling between judges and procuring the services of lawyers. Some evidence is flimsy, some is missing, and the town citizenry has so sympathy for Johnny at all. It takes the disappearance and reappearance of some of the characters to add to the interest of the trial. In the end, our gunfighter/rancher Johnny finds himself about to explain the situation to his father.The characters form the first two books are active here, as well as meeting a few new faces. There’s the Sinclair family of Guthrie, Guy and Johnny and the members of the ranch work crew and kitchen folks. The sheriff Stoney is a solid lawman who is familiar with Johnny’s past. The longtime friend Burnett serves as a person of contention in the first part of the book and then is heard from no more after a point. There’s the interesting Delice, the local madam, who serves as Johnny’s confessor and wise advisor. New faces include the two marshals who play the standard good cop/bad cop game, and we meet a few stage coach passengers who provide some humor on the road to Utah. Once in Utah, the reader will meet a good supply of the citizens of the town.There are times when the story is very clear. This third episode adds a dimension that the first two didn’t use very much, which is some good exploration of the inner thoughts and feelings of the characters. This leads to a finer understanding of the characters that appeared only a little in the first two books.At times, too, there were some lapses in the story telling. In the middle of the book, there are portions that read as though the editor changed the way the story was delivered, and then switched back to the original plan, only to seem to switch once more near the end of the book. Such problems are a bit of a distraction – and perhaps could have been avoided.Of the three Johnny Fierro novels, this third one is the better of the set. I think this is my favourite Fierro to date. I love a tense courtroom drama, and March delivers on that in spades. But what I really love about this book how all the hints and clues in the previous books about his horrendous childhood crystalise into a full-on realisation of what formed the man he is now. Fierro isn't a hero- he's too damaged. He is a flawed character, but one who is fundamentally good, and in Stacked Deck we get the confirmation we suspected about what forces implanted those flaws and made him wary and distrustful, secretive and guilt-ridden.Oh, and above all, devious. This book is devious Johnny at his best. The whole narrative of his defence is both tense and oddly, rather amusing (in a wry sort of way). Because at the end you just nod and say "Of course! Of course Johnny schemed and plotted to make this work out. Of course he was shifty, sneaky and underhanded about it, because that's who he is. Cocky and sardonic and Machiavellian." It's most definitely who he is, and this book shows you why.Most of all, Johnny's relationship with Guy moves on, with Johnny's growing affection for his elder brother showing the softer side of his character. Guy's tested here, and - as we'd expect - Johnny doesn't make it easy for him to come through.Oh, and any ideas about the veiled lady? Whistles...Definitely a good read if you like solid characterisation and fast paced action.